Supper at Emmaus (After Caravaggio) • Joe Forkan 2006-2009 oil on linen 96"x 38"
This painting is based on Caravaggio’s Supper at Emmaus from 1601, which illustrates a dramatic moment from the story of Jesus’ resurrection. I was interested in Caravaggio’s take on the story because of his depiction of the moment of discovery, when the disciple’s “eyes were opened”, and for his symbolic use of the still life to reinforce the central idea of his painting. The symbolic references used in the paintings of this time period are somewhat obscure to us now, it is still clear from looking at the work that each figure, element, and gesture was an important consideration in the presentation of the story, all subsumed into the final image. One of the qualities that I most enjoy about narrative painting is that there is a clear story to be presented, but the specific events of the narrative give you great latitude for formal, conceptual or expressive shifts and digressions that can set a different tone or shift the story’s implications. In my painting, I was looking to create a kind of visual and narrative tension between the figures, the dramatic space, and the still life, one that is suggestive of a larger narrative, and that hopefully moves beyond the specifics of the Jesus story, the Lebowski story, or the Caravaggio story, but retains a shifting, if uneasy relationship between all three, in addition to where I am trying to go with the content and the formal elements. I hesitate to be any more forthcoming about my intentions for these paintings, in that I don’t want to set a specific read for anyone else. Painting is, after all, a language of its own and in this regard, I will let the paintings speak for themselves. 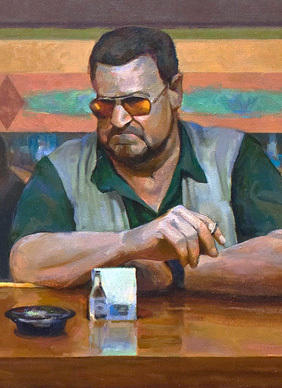 This painting was one of the most complex of The Lebowski Cycle. Its scale was daunting (96″ x 38″ / 243.84 cm x 96.52 cm), with 3 main figures that are slightly over life-size, and a deep space that I wanted to paint in a specific way. I wanted the background to be largely empty, but not in the way that Caravaggio’s paintings are empty, through the use of chiaroscuro (the contrasting effects of intense light and deep shadow). I was looking to represent space and to convey a sense of light and shadow through the relationships of large color shapes, rather than using a more dramatic recession into shadow. This painting will be included in the Laguna Art Museum‘s exhibition The OsCene 2010 – Contemporary Art and Culture in Orange County from February 21st – May 16, 2010. 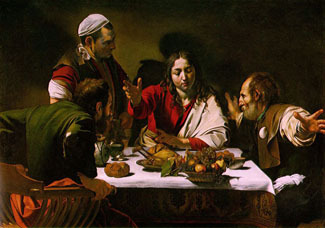 This entry was posted in Exhibitions, Figurative Painting & Drawing, The Lebowski Cycle and tagged allegory, Baroque painting, Caravaggio, chiaroscuro, Coen Brothers, contemporary, figurative painting, Jesus, Laguna Art Museum, narrative painting, painting, symbolism, The Dude, the OsCene 2010, The Passion of Christ, The Supper at Emmaus, • The Lebowski Cycle on February 12, 2010 by Joe Forkan. This is fantastic, Joe. Enjoyed seeing it and congratulations on your entry in the show! Congratulations on the exhibition. Very cool. I saw your painting in Laguna Museum and I really loved it. when are you going to update your Lebowski Cycle? I can’t wait to see them. I am your fan! I second Ryan on this one. Please sell prints. I can’t afford all of them, but I really really want them all! I am making some prints and a catalog that will be available after the show – too much going on to get everything done before this opening.